John Hussman takes Fisher to task on how markets work Failed Transmission – Evidence on the Futility of Activist Fed Policy. Any economist with even a vague understanding of how securities are priced should understand that elevating the price that investors pay for financial securities doesn’t increase aggregate wealth. A financial security is nothing but a claim to some future set of cash flows. The actual “wealth” is embodied in those future cash flows and the value-added production that generates them. Every security that is issued has to be held by someone until that security is retired. So elevating the current price that investors pay for a given set of future cash flows simply brings forward investment returns that would have otherwise been earned later, leaving little but poorly-compensated risk on the table for the future (see QE and the Iron Laws for an illustration of this process). 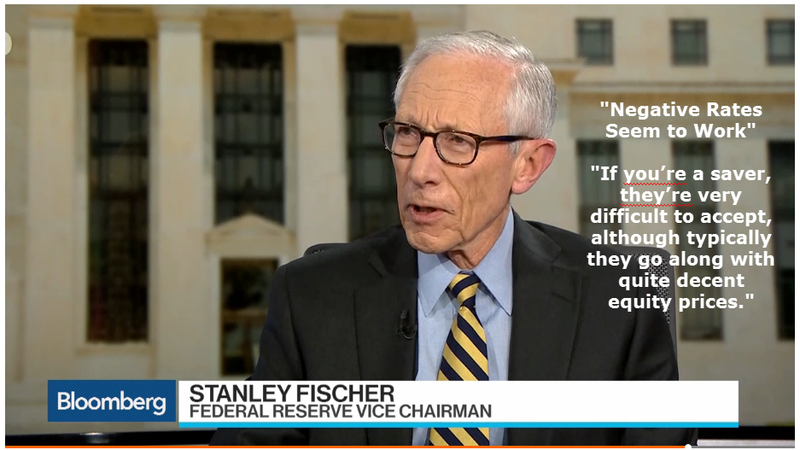 To be fair, there’s a kernel of truth in Fischer’s view that lower interest rates are “better” for investors. In recent years, low interest rates have certainly encouraged speculation, stretching reliable measures of equity market valuation to the third most offensive level in U.S. history next to 1929 and 2000. But Fischer’s statement is also incomplete. A clear understanding of how financial securities are priced suddenly turns Fed policy from something that seems quite generous to investors into something that’s actually terrifically hostile. See, the lower the interest rate, the better it is for investors, but only provided that investors wholly ignore the future. In reality, depressed interest rates ultimately benefit only those investors actually cash out at the speculative pre-crash extremes that the Fed seems so fond of producing. 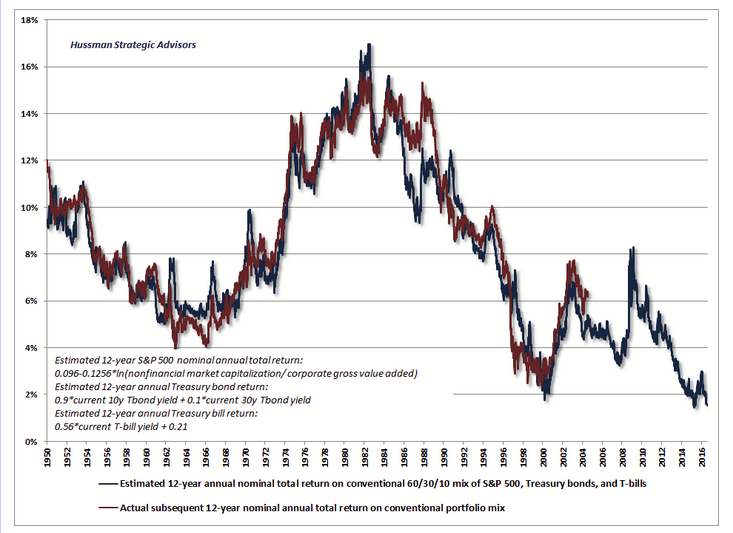 From here, for example, we estimate that the prospective 12-year nominal total return on a conventional portfolio mix (60% stocks, 30% bonds, 10% cash equivalents) is likely to average just 1.5% annually. As for the S&P 500 Index itself, we presently estimate annual total returns of just 1.4% annually over that horizon, with a strong likelihood of cyclical losses on the order of 40-55% in the interim (which would be a rather run-of-the-mill outcome from present extremes). Real prospective long-term returns are already likely to be negative on both fronts after inflation. The blue line on the following chart brings the future of conventional investing up-to-date. The foregoing chart estimates 12-year prospective S&P 500 total returns using the log ratio of nonfinancial market capitalization to corporate gross value-added. The two have a -93% correlation on that horizon in post-war data (negative, because higher valuations imply lower subsequent returns). The US does not have negative rates, but it certainly has had amazingly low rates. What Fisher said about negative rates applies equally well to low rates. By holding rates too low too long the Greenspan Fed created a huge property bubble. It certainly was not the saver. The beneficiary of the bubble was the equity holders and bank CEOs. Not only did financial insiders make a fortune in stock options in the runup, the Fed bailed out the banks after the crash as well. In his speech Fisher said Negative Rates Seem to Work in Today’s World. Negative rates “seem to work” for whom?